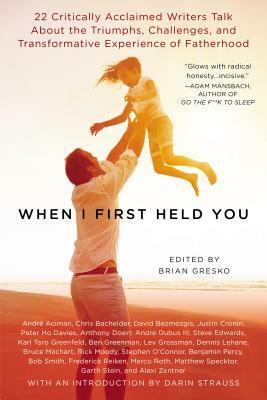 From some of today’s most critically acclaimed writers—including Dennis Lehane, Justin Cronin, Andre Dubus III, and Benjamin Percy—comes a rich collection of essays on what it means to be a dad. Becoming a father can be one of the most profoundly terrifying, exhilarating, life-changing occasions in a man’s life. Now 22 of today’s masterful writers get straight to the heart of modern fatherhood in this incomparable collection of thought-provoking essays. From making that ultimate decision to have a kid to making it through the birth to tangling with a toddler mid-tantrum, and eventually letting a teen loose in the world, these fathers explore every facet of fatherhood and show how being a father changed the way they saw the world—and themselves. Brian Gresko is a stay-at-home dad and writer based in Brooklyn. His essays and journalism have appeared on the Huffington Post, Salon, TheAtlantic.com, the Daily Beast, the Paris Review Daily, the Rumpus, and the Los Angeles Review of Books, among numerous other publications. He has also contributed to Glimmer Train and Slice magazine. He keeps a daily column about dads for Babble and is currently at work on a novel.